The Hotel Marina has smart decor and furnishings. There is plenty of entertainment here both day and night. 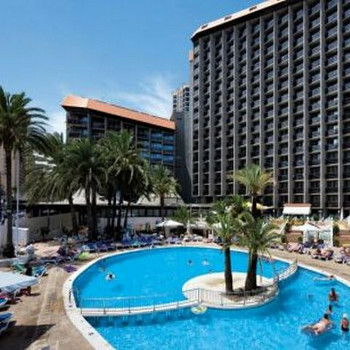 Hotel Marina has good sized bedrooms with plenty of electrical sockets,hair dryer and tv, (about 6 english channels)---The food is typical Spanish Hotel Buffet Fayre--Lots of nationalities stay here and it is a favourite with Spanish Pensioners during the off peak seasons. Staff are OK -- We thought the room we had was not cleaned as well as it could have been. It has a Super location for the Nightlife and the Beach is only 5 minutes away. The Hotel has recently opened a New Bar adjacent to its Swimming Pool " The Secret Fountain" but because of this the Pool is no longer private and anyone can use it and the Sunbeds etc This also causes a security problem around the Pool Area and gives anyone access to the rear entrances of the Hotel, If you carry any items of value keep your eye on them in these areas of the Hotel in particular---I found this "Open to All" Policy very off putting and would not use the "Marina" again until the Management decides if it is running the Hotel for the benefit of its Guests or patrons of its New Bar. this hotel is AMAZING!!! We booked ourselves and weren't expecting the location!!! We were right around the corner from all the nightlife and very close to the beach!!! The food is so good, plenty of choice and you can eat loads!!! Only downfall was breakfast but we didnt starve!!! We didnt go to any of the entertainment but it looked okay from when we were sat in The Shamrock bar right opposite the hotel!! Cant wait to go back next year!!! Absolutley FAB!!!! having read these reviews i was OMG! however, position of hotel is excellent staff in reception/cleaning staff v good! restaurant staff surly especially blond girl who greets at entrance ....food resonable...something for everyone...would go back as very good position and the hotel is 4 star! not 3star! Stayed in many hotels in benidorm this one was the worst by far. Spent half of holiday waiting for lifts as we were on the 17th floor, everyone was complaining how long wait there was. The food was "canteen" style, service in dining room not good, had to get own knife and forks etc, food luke warm. Rooms ok but in need of redecorating, our room was under gym which was only used by spanish people as there is quite a large charge for hotel guests, the noise from the gym on our ceiling was terrible. Would not return to this hotel, we were very dissapointed. Stayed at the Marina first 2 weeks in june. Hotel & food are good. Rooms all have a pool view, mini fridge, tv. The location is terrible. Didnt get no sleep for 2 weeks because of the noise. Im ashamed to be british. The british, men & women were shouting, fighting & being sick till 8.30 every morning. It was disgracefull. You would see grown men asleep on the road side at 9.30 in the morning in there own sick.We looked down into luckys bar from our balcony & 4.30 (afternoon)we saw 2 men fighting in their late 40s. One man hit the other, he fell back onto his head knocking him out for 5mins,i thought he was dead.My 19yr old son was punched by a bouncer, he also had his wallet stolen with credit cards in. My 17yr old son who likes photography was out at 8.30 in the morning had bottles thrown at him by a group of britsh men & women. All i can say is if you like this sort of thing BOOK IT. I love Benidorm and try to visit 3 times a year. I can tell you the hotel Marina is the WORST hotel I have stayed in. On arrival both a friend and myself had booked single rooms and upgraded them to deluxe double rooms for single use. There seemed to be some confusion when we checked in, I was then told the rooms had NO balconies! This seems a little bizarre considering we upgraded to deluxe? I complained and was told they would try to move us the next day, after complaining again the next morning the general manager told me there is nothing the hotel was prepared to do! I asked him to confirm this and sign a letter to state they would not be prepared to move us; this letter was promised to me every day and NEVER arrived! The Marina food is the most tasteless bland array of cooking you will ever find, even the roast beef and Yorkshire puddings have no taste! Just like their dishwater soup. We ate out most of the time and found the Wooky Hollow opposite the hotel good value and great tasting food. Benidorm is great all year round, the Marina is in a great position but this is what you are paying for not the quality of hotel. We thought the Hotel was lovely. Great central location, friendly and efficient staff, clean, well maintained rooms. We have stayed in most of the 3-4star hotels in Benidorm and thought this was up there with the best. The food was beautiful, there was enough choices for every pallet. There was a lot of older Spanish people in the Hotel, but we are in Spain! and always find the Spanish on the whole pleasant and friendly. We try to convert with them in their language (even though our Spanish is very limited)) believe me, it makes the world of difference. Our only complaint was the price of the gym. This is a very good hotel in a great area (very central), the room and common areas are really nice. However this is possibly the worst hotel my family or I have stayed in for food. I think that the review's I have read have missed the mark totally, they state that this hotel has limited food, for limited read the only meat available on some nights was chicken wings and pork ribs. It was poor, with very little fresh produce at either breakfast or Dinner (waiters were even opening the croissants from packets). We took a 16 month old, and found it difficult with food every night. Some of the staff tried to help however when weddings were on in the hotel (every Saturday) all help was rescinded unless you were Spanish. My husband and I are a couple in our 50s and went for 7 days and stayed at the Marina for the first time. We have stayed in many hotels in Benidorm, this being amongst the worst. Room not ready when we arrived at 12:30pm, (which is okay)then we were given key to room on top floor which was already occupied. Back down to reception and given another room on top which 2 people came into at 1:00am. Scary. Went to breakfast, complained to reception but not given any satisfactory reply. Went back to room to find our key deactivated. All the way back down to have it reactivated again. Still no explanation. Not a good start. Cosmos only have 1 rep and they don't attend the hotel. Rang them to let the know of problems and heard no more. Hotel was very clean and we had a good room with 2 double beds and a brilliant view. Downside was the gym was on top of us. Very noisy if you want an afternoon siesta. Hotel in a brilliant location with a short walking distance to anywhere whether it be bars, clubs, beach or old town. Noise from outside didn't really bother us. Only saw one member of staff actually smiling and that was in the restaurant. Didn't even get the usual 'ola' from the maids. After being to other 3 & 4 star hotels this was very poor. Food was either warm or cold; very rarely hot. Many times going to the hot buffet and see the trays empty. They were not quick to replace them. Most hotels have a special; carvery, salmon or something like. Once they had a carvery which the meat was just hascked at and left on a tray to help yourself to the pieces. Packed lunch on the other hand was one of the best we have had. We love Benidorm and are going back at the end of August - but definitely not to this hotel. Definitely does not warrant 4* rating.